The Terror Dog was relatively new territory for Art Asylum. Only once before had they released an animal Minimate (Muffit from the original Battlestar Galactica series was the first), and since AA is amping up the production value of their releases, they found a way to not only make the Terror Dog a fun diversion from the usual formula, but they also packed it with a surprise. Underneath all of the sculpted pieces that make the animal form, there is a basic Minimate body holding it all together. 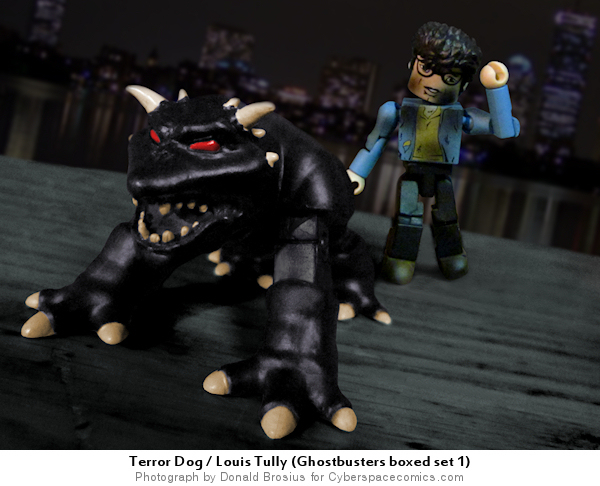 Seeing the opportunity to be true to the movie and give buyers a treat, AA designed the Terror Dog to be taken apart to reveal a hidden character: a very disheveled Louis Tully! 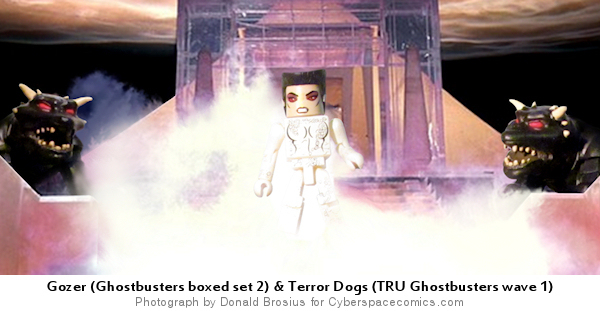 For this week’s first image, I basically just superimposed Gozer and the Terror Dogs over a screen capture of a scene from the end of the first Ghostbusters film. The lower quality of the image was a direct result of working the Minimates into a screen capture – the movie was filmed long enough ago that getting a really nice quality shot is pretty much impossible without heavy restoration. So instead of putting in 5 or 6 hours to essentially recreate the background, I simply took over-saturated photos of the Minimates so that they would match the image quality of the screen capture. The second image was a straight-up photograph with some tweaking and a replaced background. I set them on a wooden desk, and that worked as a pretty decent base for a late night dock scene. I muted and re-colored this image in much the same fashion as the Kree Soldiers image that was featured back in October. Having Louis inside the Terror Dog is an awesome way to make that figure.